Dror Paley, MD, FRCSC, is the founder (2009) and director of the Paley Institute in West Palm Beach, Florida. Prior to that he was the founder (2001) and director of the Rubin Institute for Advanced Orthopedics, and the director of the International Center for Limb Lengthening (ICLL) at Sinai Hospital of Baltimore from 2001-2009. He was the Chief of Pediatric Orthopedics at the University of Maryland in Baltimore 1987-2001. He is internationally recognized for his expertise in limb lengthening and reconstruction. Dr. Paley trained under the guidance of Professor Ilizarov of Russia (Ilizarov method) and Professor Debastiani of Italy (Orthofix method). In 1986, he introduced the Ilizarov method to the United States and Canada. Since that time, he has performed more than 20,000 limb lengthening and reconstruction-related procedures. Patients come to his Institute from all 50 states and from more than 80 countries over six continents (North and South America, Europe, Asia, Africa, and Australia). Dr. Paley organized the first Ilizarov course in 1987 and the first ASAMI North America (Limb Lengthening and Reconstruction Society) meeting in 1989. He served as the first president of this subspecialty society (now called the LLRS-Limb Lengthening and Reconstruction Society). He was the past president-elect of the International Limb Lengthening and Reconstruction Society and the Chairman of the Combined Meeting of ILLRS, LLRS, and ASAMI International-BR. He organized and ran the internationally attended Annual Baltimore Limb Deformity Course from 1989-2008. He has lectured and demonstrated surgery in more than 80 countries and provides training for specialists from around the world through a fellowship program. Dr Paley has won several awards, including a Gubernatorial Citation for Outstanding Contributions in Orthopedic surgery in 1990 by the Governor of Maryland and the Pauwel’s Medial in Clinical Biomechanics in 1997 by the German-Speaking Countries Orthopedic Association. Best paper/poster award by SICOT, AAOS, POSNA, AORS. His book was also awarded the best illustrated medical textbook in 2003. He was recently awarded Health Professional of the Year by the Chamber of Commerce of the Palm Beaches and was named Health Hero of the Year by the Palm Beach Medical Society. Dr. Paley also initiated and organized several fundraising initiatives including the Save-a-Limb Fund and currently runs the Paley Foundation. He has published over 130 articles in the peer-reviewed literature and has authored and edited 5 books and 40 book chapters. His latest book, Principles of Deformity Correction, has set a new standard in the understanding and treatment of limb deformities. He is currently completing a book on the Congenital Lower Limb Deformities. He was professor of Orthopedics, chief of Pediatric Orthopedics and co-director and founder of the Maryland Center for Limb Lengthening and Reconstruction at the University of Maryland between 1987-2001. On more than one occasion, he was awarded the Orthopedic Residents Best Teacher Award. He was adjunct Professor of Orthopedics at the University of Toronto (2009-2014) and taught and operated at the Hospital for Sick Children in this role. He is also a Professor of Orthopedics at the University of Vermont. He obtained subspecialty fellowship training over the course of three years in Pediatric Orthopedics, Hand Surgery, Trauma Surgery and Limb Lengthening and External Fixation Surgery. He was also awarded the AOA-COA North American Travelling Fellowship. Dr Paley completed his internship at The Johns Hopkins Hospital in Baltimore in 1980, and his orthopedic surgery residency at The University of Toronto Hospitals in 1985. He received his medical degree from the University of Toronto Medical School, Toronto, Canada in 1979. Click here for Dr. Paley's CV. 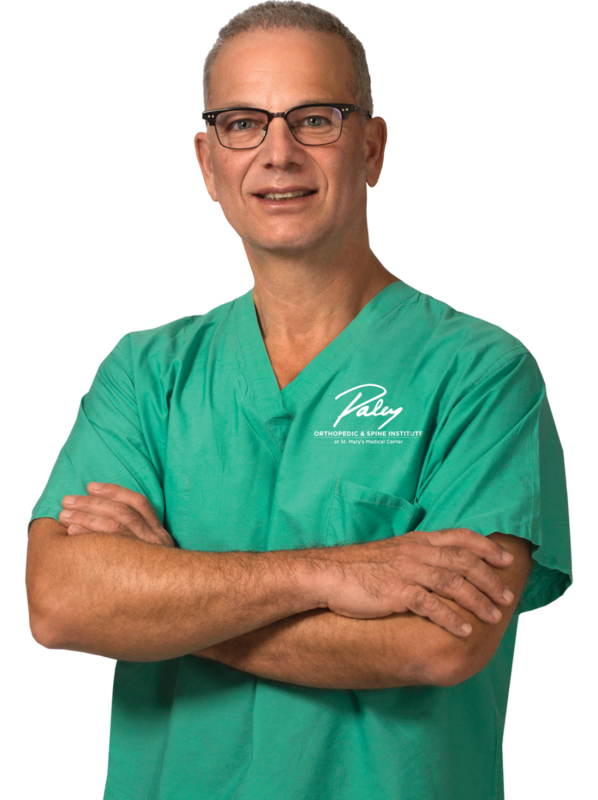 Dr. Paley grew up in Canada and moved to the United States in 1987. He has three grown children and one step-son and is happily married. He enjoys fitness training, cycling, skiing, rock climbing, scuba diving, nature photography and studying history. He is fluent and lectures in six languages – English, Hebrew, French, Italian, Spanish and Russian and can converse to a more limited extent in Portuguese, German and Arabic. Dr Paley has developed more than 100 new operative procedures for bone and soft tissue reconstruction of congenital, developmental and post-traumatic limb disorders. (e.g. superhip procedure, superknee procedure, superankle procedure, ulnarization, percutaneous Gigli saw osteotomy, focal dome osteotomy, angulation-translation osteotomy, etc). His new methods to lengthen and/or straighten deformed bones and to reconstruct congenital short limbs (LRS) avoid amputation, a frequently recommended alternative. The results of LRS for conditions such as fibular hemimelia, tibial hemimelia and congenital femoral deficiency have given children who would have otherwise lost their legs, excellent function without the need for a prosthesis. Furthermore the methods used to classify these conditions now bear his name. Dr Paley has also discovered a new, simple, but accurate method for prediction of leg length discrepancy and height at skeletal maturity. The Multiplier method has replaced the previous more complicated methods. His method for using a combination of an intramedullary rod and an external fixator (LON and FAN of deformities) has shortened the treatment time required with an external fixator while maintaining the accuracy of correction. Dr Paley is also currently the most experienced surgeon using fully implantable limb lengthening dating back to the mid 1990s with the Albizzia, then during 2001-2011 with the ISKD and most recently with the PRECICE. Dr. Paley, was the first US surgeon to implant the PRECICE 1 device in the US and is the surgeon inventor of the PRECICE 2. Perhaps his most noteworthy contribution to medicine is the science of limb deformity correction, sometimes referred to as "deformity theory." This is published in his 800-page textbook, Principles of Deformity Correction (Springer Verlag, 2002) which is considered the ‘bible’ of deformity correction surgery. This book has been reprinted 4 times and is considered an orthopedic best-seller and classic. Other upper and lower limb deformities due to: growth arrest, fractures, radiation, infection.